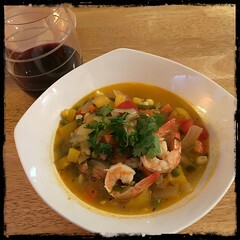 Asopao is a traditional Caribbean soup made with rice and typically made with chicken, pork, beef or seafood such as shrimp. Typically the rice is cooked in the soup but this alternative method will help prevent the rice from overcooking. Our version takes it’s cue from the island of Puerto Rico. 1. make the rice and precook the frozen corn and peas. 2. In a dutch oven or stew pot, heat the olive and coconut with 1 tbsp Zio’s Sazón con Achiote y Culantro. 3. Add the onions, garlic and the jalapeño peppers. let sauté until onions become slightly translucent. 4. Add 1c white wine and let come to a boil. 8. When it returns to a boil, add 1c chicken stock, return to boil. 12. Let cook for about 10-20 minutes and then add the handful of chopped cilantro and lime juice. 13. Finally add the thawed shrimp and let the Asopao return to a boil cooking for about 5-10 minutes or until the shrimp seem ready. 15. Serve over rice and garnish with a bit of fresh cilantro.